Kamran Ashtari: "Internet is Iran's only public forum"
Do satellite television, the Internet and digital film offer an escape from censorship in a country like Iran? This what the viewer starts to wonder while watching the Iranian documentary Head Wind by Mohammad Rasoulof, which showed early in April 2009 during the Movies that Matter film festival. 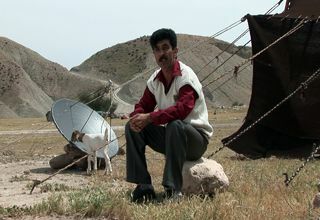 The documentary shows how satellite television is storming Iran despite the fact that it is prohibited. Technicians install the systems in secret. Even in the tiniest villages, and even in nomad tents, the ordered dish antennae are delivered. A journalist who has been running a cafeteria since his newspaper was closed down does as much as possible using the Internet. Two film experts collected DVDs of foreign films and rent these out to a fixed group of clients, illegally. "This documentary does a great job of showing the part played by the media in Iran," says Kamran Ashtari, journalist, photographer and active blogger. "Satellite television cannot be stopped. The government does not have the resources to remove the millions of satellite dishes. People want contact with the outside world, want to hear world news, want to watch films. Not only America's latest hits and French classics, but also uncensored Iranian films. Not only because they are fed up with censorship and propaganda: the state television is really very boring!" "Internet is easily accessible, through Iranian providers and at Internet cafes. The government wants to control the content. But blocked sites can be easily unblocked. Iranians use the Internet for political purposes, but not just for that. They also want to chat with family and friends, establish contact with people all over the world and participate in blogs. Many people also use the Internet for their studies and work. Films can be acquired everywhere, even outside of the city, in small shops and on the street. The prohibited Iranian film Marmulak, for example, was soon available everywhere." Thus prohibitions and censorship can be circumvented; people find a way to get around them. Ashtari: "But censorship is never powerless! It strongly affects how people view information." Whether this will also lead to changes in society is difficult to say according to Ashtari. "Political discussions on blogs certainly affect Iran's political landscape. Internet is the perfect place for freedom of speech; it is Iran's only public forum. For the opposition, of course, but even more importantly for civilised debate. Internet gives us the opportunity to practice that." Head Wind was shown at Movies that Matter. (The Hague, 2 - 8 April 2009.) Kamran Ashtary participated in the debate about the media in Iran which took place after the sceening. Movies that Matter is supported by the Hivos NCDO Culture Fund .